Figure 1. 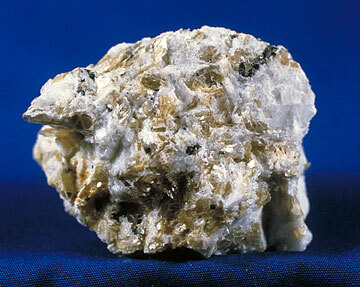 Cassiterite (SnO2), the sole source of commercial tin. Credit: Mineral Information Institute. Figure 2. Tin is extracted from cassiterite by the ore being crushed (1) and passed through a sink-float separation system (2). The washed ore is roasted in an oxidizing atmosphere (3) to remove arsenic and sulfur. Tungsten is removed by electromagnetic separation (4). The tin oxide is then roasted in a blast furnace (5) with coke (6). 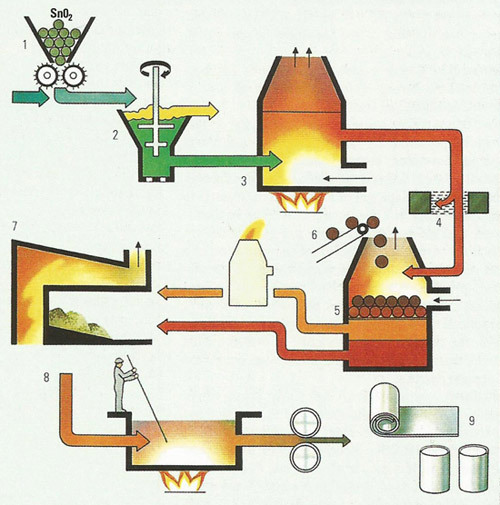 The tin produced is refined in a reverbatory furnace (7). The slag produced from the blast furnace is reworked and the tin obtained is also refined in the reverbatory furnace. Further refining takes place to remove any remaining impurities (8), before the tin is pressed and rolled (9). Tin (Sn) is a malleable, fairly soft, silvery-white, metallic element in group 14 (old group IVA) of the periodic table. Tin exhibits allotropy: white (β) tin, the normal form, changes below 13.2°C to gray (α) tin, a powdery metalloid form resembling germanium, and known as "tin pest." In antiquity, tin was used in the alloy bronze, but compositions were variable. Indeed it is thought that the first discovery was due to accidental smelting of mixed ores of copper and tin. Tin occurs mainly as cassiterite (tin dioxide, SnO2), from which it is obtained by smelting with coal (see Figure 2). Cassiterite, the chief of tin, is a mineral consisting of stannic oxide (SnO2) with iron impurity. Cassiterite is usually translucent brown to black, with submetallic luster. It forms short tetragonal prismatic crystals, but is usually massive granular. It occurs in placer deposits, chiefly in the Malay Peninsula, and in pegmatites and other intrusive, igneous rocks. Hardness 6–7, specific gravity 6.8–7.1. Tin is mainly used for electroplating or in combination with other metals as an alloy. Pure tin is used principally for coating steel to prevent corrosion. The tin is applied in a layer, 6 x 10-6 millimeter (2.5 x 10-6 inch) thick, by either dipping the steel into molten tin and rolling, or more commonly by electrolysis. Tin-coated steel is used extensively in the preparation of cans used for food storage because it is not poisonous. As an alloy, tin is used in solders, where its low melting point is an advantage, and in bronze, pewter and various other alloys used in machine bearings. Because of its low melting point and resistance to atmospheric corrosion, tin is used in modern glass-making processes where the molten glass is floated on a layer of molten tin in a hermostatically controlled bath and allowed to congeal. The resulting glass is so smooth that it needs no polishing or grinding. Organic compounds of tin have wide applications as chemical stabilizers and biocides for crop spraying. They do not contaminate the soil permanently because the chemicals break down to harmless inorganic compounds. Tin is unreactive, but dissolves in concentrated acids and alkalis, and is attacked by halogens. Tin forms organotin compounds, used in biocides, and also inorganic compounds: tin (II) and tin (IV) salts. Tin forms two chlorides: tin (II), or stannous, chloride (SnCl2), and tin (IV), or stannic, chloride (SnCl4). Tin (II) chloride is a white, soluble solid, which can be produced by dissolving tin in hydrochloric acid. It is used as a reducing agent and also as a constituent of tin-plating electrolytes. Melting point 246°C, boiling point 652°C. Tin (IV) chloride is a colorless, fuming liquid. It is used in the preparation of other inorganic tin compounds and organic tin (organotin) compounds. When sprayed onto glass and fired, it produces a conductive coating. Tin also forms two oxides: tin (II), or stannous, oxide, SnO, a black powder used as a reducing agent, and tin (IV), or stannic, oxide, SnO2, a white powder (sublimes at 1,800°C), The latter is prepared by calcining cassiterite (in which it occurs naturally) or burning finely divided tin. SnO2 is used in ceramics, glass, and cosmetics, and as an abrasive. Tinner's rabbits is a name that has emerged recently to describe a pattern of three rabbits or hares that has been found in many parts of the world, including England and Wales, mainland Europe, China, and Russia. It occurs, for example, on the medieval roof bosses of some churches in Devon and Cornwall and is thought to be connected with the local tin-mining industry. One theory suggests the following link: Tin is alloyed with copper to make bronze, copper came from Cyprus (the words Cyprus and copper have the same root), Cyprus is the island of the goddess Venus or Aphrodite (she was born there), rabbits are symbols of Venus. Three intertwined fishes are a common Christian symbol, so the three rabbits may also have stood for the Trinity.